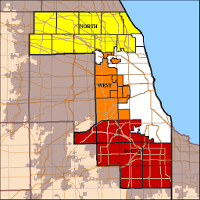 There are 138 municipalities (Cities, Villages and incorporated towns) within Cook County's 956 square mile area (227 square miles=City of Chicago, 573 square miles=Suburban cities and municipalities, and 156 square miles=Unincorporated areas). The City of Chicago is the largest municipality in Cook County; the other 137 municipalities are located within the 30 Suburban Townships of Cook County. The CBSAs meet on a monthly basis to address local issues homeless service providers are facing or to better facilitate homeless services in their immediate communities. If you want to get involved with the Alliance, attending one of these meeting is a great place to start. Go to our calendar for dates, times and locations. Design by Zymphonies. Design Customization by Jeremy Heyboer.